Most amateur astronomers – and many of those with similar interests but who are not currently practising observers – have only a sketchy understanding of space flight. This book provides an introduction to its mechanics. The beauty of this book, written by an engineer who is also an accomplished science writer, is that it covers the subject comprehensively, and yet is almost entirely descriptive and non-mathematical. It deals with all aspects of space flight, from how to leave the Earth (including the design of the rocket, mission planning, navigation and communication), to life in space and the effects of weightlessness. The book also includes sections describing how an amateur can track satellites and understand their orbital parameters. "Well, it’s not rocket science, is it?" How many times have you heard people use that expression when they mean something pretty simple? There are other areas of science and technology that are arguably more challenging than rocket science, but no other (perhaps apart from brain surgery) has entered mainstream English vocabulary as a byword for ‘difficult’. But ‘hard to understand’ isn’t the same as ‘impossible to understand’, as Dr Lucy Rogers – who is herself currently working as a rocket scientist – shows in this book. She describes, in everyday terms and entirely without complex math, just what is involved in launching something into space, to explore the universe beyond our small planet. 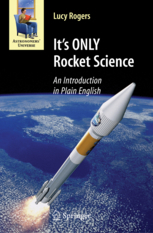 If you want to understand the fundamentals of space flight, from how to leave the Earth – including the design of the rocket and vehicle, mission planning, navigation and communication – to life in space and the effects of weightlessness, begin your journey here.